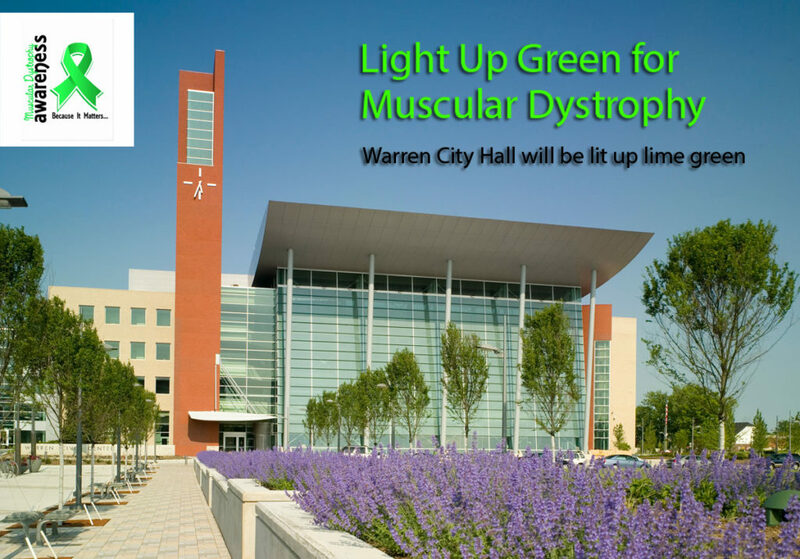 Warren City Hall will be lit up lime green for the “Light Up Green for Muscular Dystrophy” initiative to bring awareness to muscular dystrophy. Go green! Tonight the entire Warren City Hall will be lit up lime green in solidarity with the “Light Up Green for Muscular Dystrophy” Awareness Month 2017. This initiative is aimed at bringing awareness and increasing support for all the families affected by this debilitating illness. Since its inaugural year, the “Light It Up Green” initiative has received proclamations from 47 states. To date, 47 states and 16 landmarks participated with proclamations and lightings to promote muscular dystrophy awareness. This year there will be 60 lightings across the U.S. and Canada this year, and the City of Warren is proud to “light it up green” in solidarity with initiative was for many years the central subject of the Jerry Lewis telethon on Labor Day. Mayor Fouts hopes that this effort, first started by Jerry Lewis, will continue until a cure is found.